Cline/Cleaver/Ochs Featured in Times Free Press – Barking Legs Theater • Chattanooga, Tenn. Thanks to the Times Free Press for highlighting the Nels Cline/Gerald Cleaver/Larry Ochs Trio, who will be in concert at the Legs on Monday, April 15 at 7:30 pm. Follow this link or read on below. 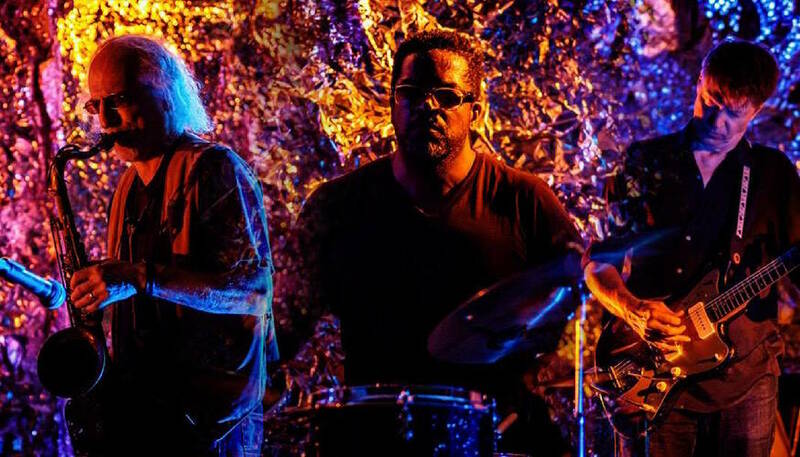 Shaking Ray Levi Society and Contemporary Performing Arts of Chattanooga are partnering to present Nels Cline, Larry Ochs and Gerald Cleaver in a night of improvisation, jazz and rock at Barking Legs Theater, 1307 Dodds Ave., on Monday night, April 15. This trio was created by Detroit native and internationally acclaimed percussionist Gerald Cleaver, in collaboration with Larry Ochs, founder of Rova Saxophone Quartet. With the addition of experimental guitar icon Nels Cline in 2015, the trio’s lineup was complete. Cline is best-known as lead guitarist in the band Wilco. His recording and performing career — spanning jazz, rock, punk and experimental — is well into its fourth decade, with more than 200 recordings, including at least 30 on which he is leader. Rolling Stone named him as one of 20 “new guitar gods” and one of the top 100 guitarists of all time. Beyond Wilco, Cline performs with jazz guitar prodigy Julian Lage, The Nels Cline Four (with Lage, bassist Scott Colley and drummer Tom Rainey) and leads The Nels Cline Singers (featuring Scott Amendola, bassist Trevor Dunn and Cyro Baptista). Saxophonist Ochs is a founder of the Rova Sax Quartet, which focuses on applying improvisational strategies within the context of contemporary compositions. The quartet marked its 40th anniversary in 2018. Drummer Cleaver is a product of Detroit’s rich music tradition. Inspired by his father, drummer John Cleaver, he began playing at an early age and, as a teenager, gained invaluable experience playing with Detroit jazz masters Ali Muhammad Jackson, Lamont Hamilton, Earl Van Riper and Pancho Hagood. After serving as assistant professor of jazz studies at the University of Michigan and joining the jazz faculty at Michigan State University, he moved to New York in 2002. He has performed or recorded with Roscoe Mitchell, Matt Shipp, William Parker, Craig Taborn, Charles Gayle, Jeremy Pelt, Tomasz Stanko, Charles Lloyd and Miroslav Vitous, among others. Cleaver has released four recordings and leads the bands Black Host and Uncle June. For tickets to the Barking Legs show: www.brownpapertickets.com/event/4101159.